Since its first introduction in the 80s, Marshall JCM has always been one of the most famous lines of guitar amplifiers in the world. Up to now, it’s has a very long period of time. A lot of guitar amp models came to the market, some were even feature-rich, elaborately manufactured and well-advertised. But Marshall JCM still stays firmly in their chamber. What makes JCM800 is so successful? It’s because the JCM800 never stops improving and adapting to new requirements of the new era. 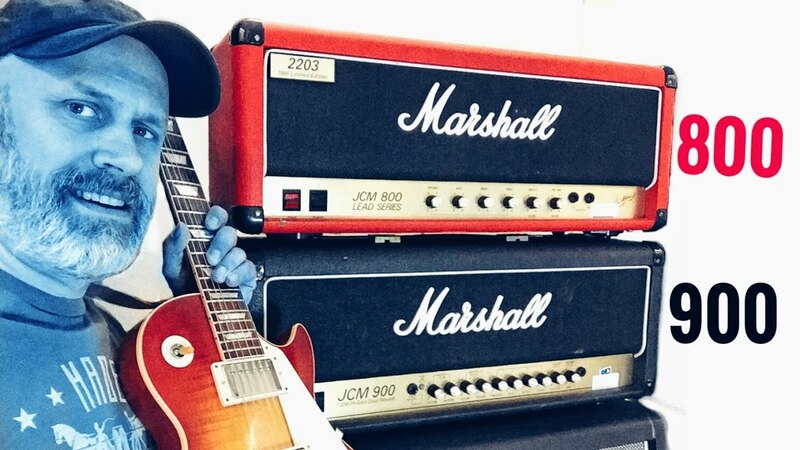 Marshall JCM800 2203X inherits a lot of signature features of its ancestor – the first JCM800 model in 1981. JCM800 2203X still has a simple classic Marshall-style design. All the controls are placed in the front panel which was made in gold for a luxurious look. Above it lays a grille cloth with a simple big Marshall logo. The rest of the head is made from black vinyl for reducing the mass, but there are still corner caps to protect the parts from breaking. In the back side of the panel, we can recognize 3 ECC83 vacuum tubes in the preamp section. In the power amp section, we have 4 EL34 valves. They are all the highest performance tubes for a guitar amplifier at this moment. There is not much change in appearance between 2203X and older models but it still looks more modern and flashy than before. However, there is one thing that remains the same: the master volume button. JCM800 is the first time Marshall incorporate a master volume button into a guitar amplifier. With a master volume control, you can adjust the total level of both preamp and the end signal. This means if you turn in up, both your dry and wet signals will get louder. And when you turn it down, your output signal will decline gradually into the void. The master volume control allows you to adjust the level quickly when playing. When you play to the end, your song will generally get lower, as well as the effect. Both dry and wet signals will go steadily to create a more synchronization effect. You won’t be afraid of mismatch between signals to affect your performance. However, the master volume control is not the only way to adjust the level of this JCM800 head. You have another button right next to the above: the preamp volume knob. Unlike the former, the preamp volume knob lets you adjust the level of the effect before it goes into the amp stage. This means if you turn the knob clockwise, you can get more override tone while your input signal remains the same loudness. And, of course, if you turn it counterclockwise to the zero position, you will eliminate any effects and get a clean signal. This feature allows you to create a special, unique blend for your music as the dry and wet signals don’t go the same way but rather improvisational. Besides the two volume knobs, the JCM800 also features a 4-band EQ controls. If you know how to tweak your sound correctly, a 4-band EQ will be a blessing on your music. You can amplify the lows, mids, or highs of your signal to get a more balanced mix. Or you can make one of them stands out for some particular playstyles and impressions. The last knobs in the 4-band EQ, the Presence, work somewhat like another master volume control. It raises your signal to make it tighter and more fine-tuning. The last thing about the controls is input. Marshall JCM800 contains two separate inputs, one for high and another for low sensitivity. When plugging your guitar into the high-sensitivity jack, your signal will be processed through an additional gain stage to produce more override effect. As you may know, the Marshall JCM series was renowned for high gain and roar tone in the past. So this high-sensitivity jack is exactly what makes this head a JCM800. Additionally, you will notice the lack of any effect or reverb control in this head. This because the manufacturer doesn’t want to include these features but rather keep the amp as simple as possible. Thus, it will not overlap the functions of your extra pedals and tuners. If you want any effect on your signal, just connect the head with the desired pedals through the series effect loop input on the back of the head. The series effect loop is also true bypass, which stops coloring your signal when you don’t turn it on. Marshall JCM800 is such a wonderful guitar tube amp that is loved and welcomed by hundreds of users. However, it has a close cousin which is a little bit different but still powerful. Unfortunately, only a handful of guitar lovers know of its existence: the Marshall JCM900. The design of the JCM900 isn’t much different than that of the JCM800. 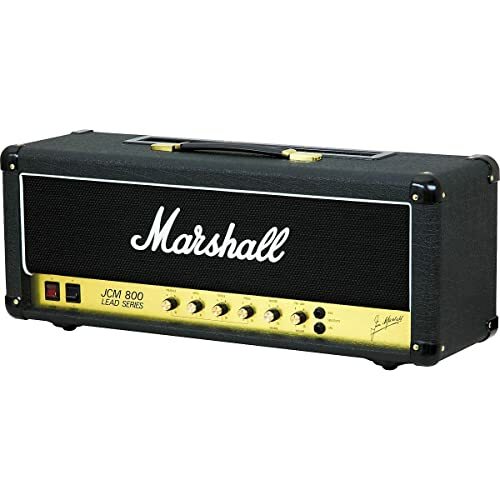 It has a similar look to the JCM800 in general: the same shape and size, the same grille cloth with the Marshall logo and 4 vinyl corner caps. The penal is also in gold and feature a simple line of controls and inputs. Of course, there are also some changes in the controls due to different use purposes of the head. Inside the head, we start to see the difference in the number and types of the valves used. The JCM900 make uses of 2 ECC83 valves in the preamp stage and 1 ECC83 plus 4 5881 vacuum tubes in the power amp section. This results in a little more gain and power in the output than that of the JCM800, although it is also a 100w head. The most different thing of the JCM900 from the JCM800 is the number of channels. The JCM800 is a single tube amp, which means it can only support mono audio signal. In contrast, the JCM900 contains 2 channels. Every channel of JCM900 is also different from each other. One is cleaner and more glistening, while one is dirtier and more overdrive. When playing with the latter. you will get stronger, gritter output signal that is more suitable for heavy and rock songs. You can quickly switch between channels by using the footswitch that comes with the head. The JCM800 is a simple head without any extra effects, but the JCM900 is different. It allows you to adjust the amount of reverb in your signal. But more impressive, each channel of the JCM900 can have a different level of reverberation and master volume. This way you can set up two distinct presets for each channel, then you can quickly switch between them as you play. These volume controls are the master volume but you still have two preamp volume knobs for each channel. Thus using the JCM900 is just like tweaking 2 heads at once but more intuitively and conveniently. In fact, JCM800 has two models, 2203 and 2204, each is 100w and 50w respectively. However, the JCM900 has two power mode and it lets you switch easily from 50w to 100 easily by changing the output on the back. This is a lot convenient and money-saving. You won’t need to buy another amp for jobs that require less or more power than the one you’re having. Similar to the JCM800, this head also offers users a powerful 4-band EQ for balancing out the mix and even making their unique tone. There is also a Series Effect Loop with true bypass input in the back of the head. However, the JCM900 itself has already colored the user’s tone, so the bypass is not so “true”. And the coloration is also the biggest negative point of this head, pulling it away from a lot of users. Jim Marshall founded the Marshall Amplification company 57 years ago with a mission to bring the best amplifiers into the music world. They created music amplifiers, speaker, headphones and brand personal headphones. Their products were used widely by average market customers and even by professional players. Fame helped Marshall become the most recognized amplifier brand in the world. The most outstanding characteristic of Marshall’s amplifiers is the high gain and overdrive. It becomes the brand’s signature sound that people always talk of the Marshall “crunch”. It helps the company establish a unique way of manufacturing and a firm standing in the market. Up to know, there’s been a lot of brands and products but none of them can beat the Marshall amplifiers with the signature “crunch”. Marshall is one of a few companies that is still making vacuum tube amplifiers or valve amplifiers. Every product has leading-class performance, inherits the best features from older models, as well as incorporating new technologies. Marshall’s amplifiers evolve through time instead of being out of date and fade away. They also vary in models and purposes. Besides the iconic JCM800 and 900 series, Marshall still has another line of JCM 2000 and a totally different JVM series. All of Marshall’s products are made elaborately to the tiniest parts. This, combined with the fact vacuum tubes are expensive, keep the price of a Marshall amplifier usually a 3-zero number. It might be out of reach for average market customers users and even impossible for budget customers. Fortunately, the company also makes less expensive vacuum tube amps or so-called solid-state amps. And to catch up with the new era, Marshall also introduces many models of hybrid and amplifier simulators, too. The company want to prove that it is not outdated and so it can compete with other modern brands even in their best categories. The company’s diversity and product’s adaptability indicates how well Marshall is doing its job. It shows the ability to change but still keep the best out of its history. Therefore, in the 21st century, we and other people in the music world are still talking about Marshall vacuum tube heads. Back to the comparison between Marshall JCM800 vs 900, they are different lines of tube amp, each of them aims to offer different solutions for the users. The JCM800 is more simple and general, it will suit many situations and purposes. It has simple controls and the way of work, all you need is just plugging in and start tweaking. It is a master volume and mono-amp hence will handle bass and lows excellently. A lot of people loves its simplicity and performance, however, these qualities sometimes can’t reach the demands of complex jobs. Meanwhile, the JCM900 offer more features and flexibility. It brings more gain and overdrive to your signal, an ideal quality for heavy or metal rock players. It allows you more fantastic options in tweaking the tone and effects, as well as easy changing between different channels. But the tonal coloration of the JCM900 is a big negative as many users don’t want their tone to be changed that much. Therefore, the Marshall JCM900 is less known than the JCM800. In summary, Marshall JCM800 vs 900, every one of them has pros and cons. You can tell which is better unless comparing their qualities with the needs of your work. They have roughly the same price, so your demands are the most important criteria to judge these heads. If you are a home user or you just want a tube amp that can work with any songs, picking up a JCM800 is ideal. But if you are looking for more dirt and overdrive in your music, as well as some unique tone, you might opt for the JCM900.